Home / Articles / Insights from The Loughborough MBA: Schmooze or dictate expected outcomes? The lawn needs mowing and you are weighing your options. You can ask a member of the family to mow the lawn. In return you are willing to pay £10. The other option is to hire a gardener and pay a similar amount. The performance for these two can be similar, so you wonder what could motivate these two to improve their performance and what would it take from your side? The logic is fairly straightforward: If you use your son/daughter, they are likely to do a good job once they get going, but you can expect that they may somehow drag you into doing some bits and bobs (‘Dad, where is the mower? Dad, can you open the gate for me?’). If you use a gardener, you also expect no less than a decent job, but you will consider the relationship with the gardener to affect performance (‘Oh dear, I forgot to offer tea. He is going to hate me and do a lousy job!’). So now you consider what it will take to improve their performance. With your son/daughter, the issue is to ensure that it is crystal clear to them what they need to do if they want to get £10 for mowing the lawn. You simply complement your good relationship with your son/daughter with a set of clear expected outcomes (even for a simple job such as mowing the lawn!). With the gardener, you reckon he/she is a professional and is likely to perform well, but a bit of friendliness between you two can give you the extra improvement in performance you are after. Do you think you got your assumptions right? A team from the Centre for Global Sourcing and Service (Eleni Lioliou, Angelika Zimmermann, myself and our collaborator Alexandra Gerbasi from Grenoble Business School) conducted an industry-wide study that looked into this aspect – but obviously not in the context of mowing a lawn. We examined this dilemma for firms that consume the same services from an internal provider and from a third-party service provider. The results of our study are far more complex than what we share here and will be presented during the Global Sourcing Conference in February 2015. In a nutshell, we found the following: when using an internal provider (your son is mowing the lawn), you will achieve better performance if you outline a list of expected outcomes. Regardless how close you are with your son/daughter, they will take advantage of the ambiguity of who does what and will eventually get you to do some work while you still pay them the £10. If you hire a gardener, it is not always the case that schmoozing with the gardener that will give you better performance. In fact, you will get better performance if you understand gardening and instruct the gardener to follow certain procedures. The gardener will figure out the quality expected from him/her based on the steps you outlined. Improving performance is not always about good relationships. In certain circumstances, such as in-house operations, specifying expected outcomes will get you the extra improvement in performance, more than schmoozing with the internal service provider. Investing in relationships with external provider can also run its course at some point as well as can be a rather costly exercise with very little return on investment. Instead, when seeking to improve performance, it is far more effective to signal quality to the external provider by specifying how you wish them to perform the service. They will get the message. The trouble with this approach is that most client firms that outsourced services have lost some of their domain knowledge and could be incapable of detailing the desired processes, but only the expected outcomes. We will leave you with these takeaways to consider them in the context of the various services your organisation consumes. Some services you use may be provided by internal providers, some by external providers, but all require some effort when attempting to improve performance. We invest in developing relationships, defining expected outcomes and specifying procedures. The big question is: Are we investing in the right place? This Blog post was written by Professor Ilan Oshri, Director of the Centre for Global Sourcing and Services. As a Top-10 UK business school among just 1% of business schools in the world to hold AACSB, EQUIS and AMBA accreditation, teaching on The Loughborough MBA is informed by the very latest research insights and best practice. 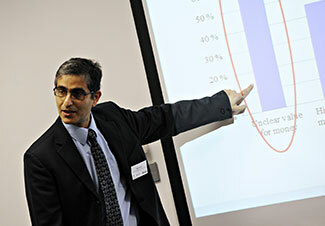 For more research insights from the Loughborough MBA, you can sign up to receive our twitter feeds and e-newsletter. See how you could accelerate your career with our 1 year Full-Time MBA and our 2-year Full-Time MBA with Internship, starting this October.